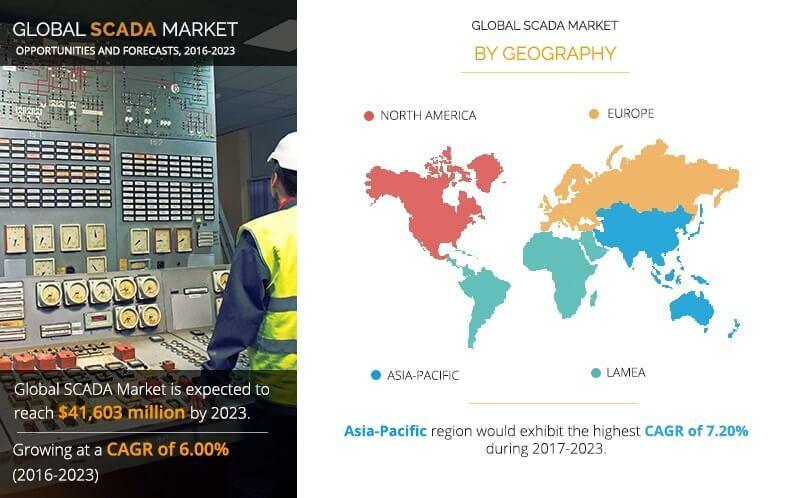 The global SCADA market size was valued at $ 27,900 million in 2016, and is projected to reach at $ 41,603 million by 2023, growing at a CAGR of 6.00% from 2017 to 2023. SCADA is a system of software and hardware elements that allows industrial organizations to monitor, gather, and process real-time data, and to control industrial processes locally or at remote locations. In addition, it enables end users to directly interact with devices such as sensors, valves, pumps, and motors through human&dash;machine interface (HMI) software, and record events into a log file. The demand for industrial SCADA system is on a continuous increase, as these systems help maintain efficiency, process data for smarter decisions, and communicate system issues to help mitigate downtime. Ongoing technological advancements in SCADA due to innovative efforts from the market players have further enhanced the efficiency of the system, which is opportunistic for the market. Growth in adoption of cloud-based SCADA system, infrastructural development such as smart cities & transportation, and high penetration of mobile SCADA systems drive the growth of the global SCADA market. However, cyber threats and requirement of high investment for setting up the SCADA system are expected to impede the SCADA market growth. On the contrary, surge in R&D activities in wireless sensor network in SCADA and rapid growth in big data along with analytics have increased the efficiency of SCADA systems, thus offering a major opportunity for market expansion. Software segment is expected to grow at a significant pace during the forecast period. The electrical power segment accounted major SCADA market share in 2016, and is expected to continue to this trend in the near future. 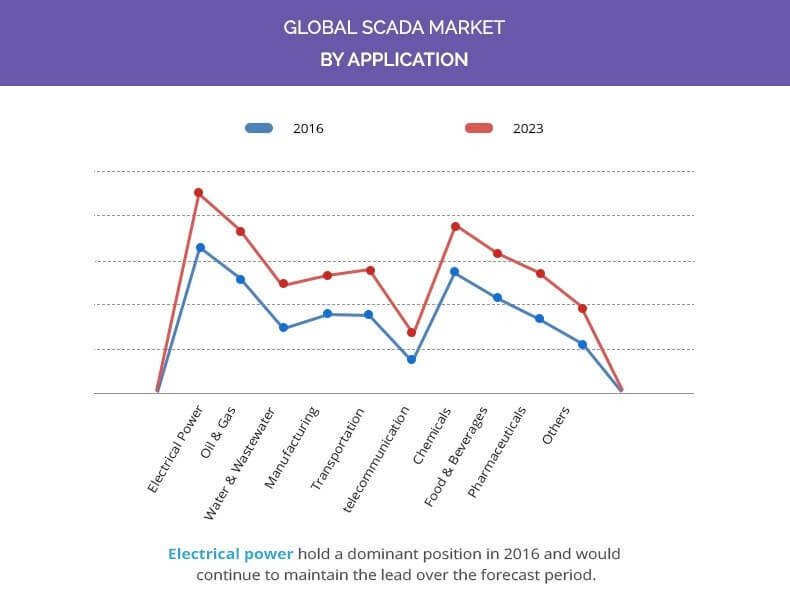 Furthermore, North American SCADA market share is expected to dominate the SCADA market during the forecast period, as it is the major adopter of industrial automation systems. The report focuses on the growth prospects and restraints of the market based on the analysis of regional trends. The study provides Porter’s Five Forces analysis of the industry to understand the impact of various factors such as bargaining power of suppliers, competitive intensity of competitors, threat of new entrants, threat of substitutes, and bargaining power of buyers on the growth of the SCADA market. The global SCADA market is segmented on the basis of offering, application, and region. Based on offering, the market is fragmented into hardware, software, and services. By application, it is categorized into electrical power, oil & gas, water & wastewater, manufacturing, transportation, telecommunication, chemicals, food & beverages, pharmaceuticals, and others. Regionally, it is analyzed across North America, Europe, Asia-Pacific, and LAMEA. The global SCADA market is dominated by key players such as IBM Corp, Hitachi LTD, Alstom, Honeywell International, ABB LTD, JFE Engineering Corporation, Mitsubishi Electric Corporation, Emerson Electric Co., Rockwell Automation, and Schneider Electric. 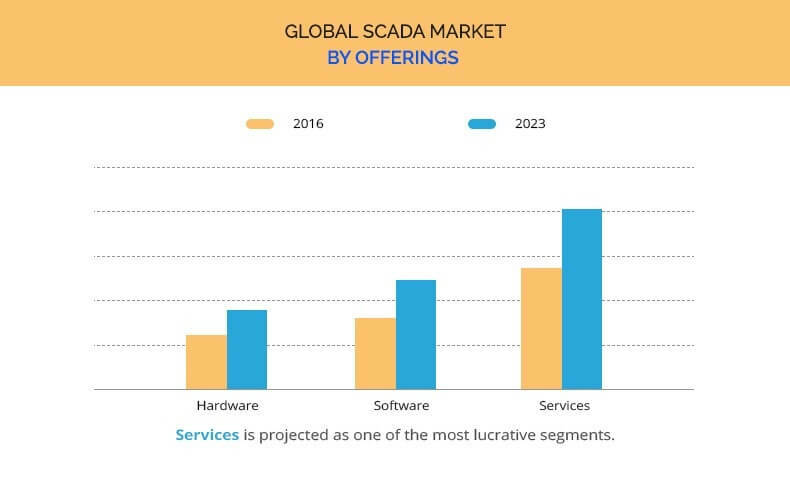 The growth of the SCADA market is expected to be driven by increase in adoption of cloud-based SCADA system, infrastructural development, high penetration of mobile SCADA systems, and growth of big data analytics. However, high risk of cyber-attack and increase in investment for setting up the SCADA system are expected to negatively impact the market growth during the forecast period. The aim of installing industrial SCADA system is to control and monitor sensors and transmitters that have been set up in the facility. An operator or controller controls the applications with the help of an HMI. The integration of a SCADA system with cloud computing technology enables operators to control applications via the internet. Moreover, cloud-based SCADA systems offer numerous benefits such as scalability, ease to retrieve files & updating, and upgrading through cloud, which have fueled their adoption over the period of time. Urban infrastructure, which includes the electricity grid, water supply, traffic control, and others, relies on SCADA systems, wherein they control functions and flow. Continuous infrastructural development, such as smart cities and smart transportation, in the developing economies, such as India, is expected to generate the need for adoption of SCADA systems. For instance, the Government of India has initiated the 100 Smart Cities Mission, which seeks to invest over $15 billion in the next few years to build efficient and effective city management solutions and infrastructure. Thus, it is one of the prominent factors boosting the growth of the SCADA market size. Currently, SCADA systems are not only being integrated in PCs but also in mobile devices. Authorized controllers or operators can remotely access data by using tablets, iPads, and smartphones as a portable HMI to monitor remote equipment and enable field operators to assess the current condition of a process. SCADA infrastructure is integrating smart mobile devices to increase the capability of the entire system. Enormous growth in big data along with analytics has increased the efficiency of SCADA systems, thus providing numerous opportunities for the market. Analytical software solutions help the companies to reduce errors, improve decision-making, and identify the root cause of problems. Therefore, multiple industries have increased their adoption of these tools to develop decision-making procedures. Automation vendors have started incorporating analytics tools in SCADA and advanced process control (APC). This study includes the analytical depiction of the global SCADA market along with current trends and future estimations to determine the imminent investment pockets. The current market is quantitatively analyzed from 2016 to 2023 to highlight the financial competency of the global SCADA industry. Porter’s Five Forces analysis illustrates the potency of buyers & suppliers in the global SCADA industry. Supervisory control and data acquisition (SCADA) system is an automated tool, which can supervise, analyze, collect data, and generate reports. The global SCADA market is estimated to witness significant growth during the forecast period, owing to increase in demand for safety, rise in need to minimize distribution & transmission loss, surge in deployment of SCADA data into cloud, and integration with corporate IT. Factors such as rise in demand for industrial mobility for remotely managing the processes of different industry verticals, increase in adoption of cloud-based SCADA systems by many small & medium enterprises due to its cost-effective attribute, and surge in adoption of mobile SCADA systems supplement the market growth across various end-user industries. SCADA facilitates remote controlling and monitoring of operations across plants in many industries by offering numerous benefits such as reduction in maintenance cost, improvement in quality, enhanced productivity, and others. Furthermore, SCADA infrastructure is being incorporated in smart mobile devices to improve the capability of the entire system. Asia-Pacific is the most attractive market, and is estimated to increase at a significant rate, owing to surge in adoption of SCADA systems by the emerging nations such as India and China for smart grid procedures and to decrease power transmission & delivery losses. Moreover, infrastructural development in this region is expected to fuel the growth of the market. Key players in the SCADA market are focused towards enhancing their existing product portfolio. This is anticipated to increase the product penetration and enable key providers to establish themselves in the emerging markets. For instance, in June 2017, Honeywell launched Experion Elevate, a real-time process supervisory control and data acquisition (SCADA) solution for secure and scalable service, and for operations technology and information technology (OT/IT). "Supervisory Control and Data Acquisition (SCADA) Market"